Because I only review theatrical and DVD releases, I wont be posting any reviews of old classic films. However, since George Lucas is dedicated to squeezing every last cent of revenue out of the Star Wars franchise he can by re-releasing all six and tacking on post-production 3D, it gives me an opportunity to (eventually) give you six straight-up reviews of the Star Wars saga. So let's do Phantom Menace. I'll just write a paragraph on the 3D aspect and the rest will be the film itself. It's awful. It's not really '3D' as we would understand it, as it's 3D retrofitted to a 2D film. Because it wasn't shot in 3D (that is, with two cameras from slightly different angles, both capturing different parts of the light spectrum) it means that the only way to make it '3D' is by using film editing software to capture layers and then make some deeper than others. So we have sprites, foreground objects and a background all at different 'levels'. It's actually much more like watching a puppet show of living cardboard cut-outs than genuine 3D. It's silly and unnecessary, and it's a toss up whether it's more annoying to watch the film with glasses on or to remove them and have a blurry background. Now to the film: It's awful. It's such a waste of a potentially great film and I'll tell you exactly how it could have been great. Whenever I hear anyone else review Phantom Menace, their first complaint tends to be that the film opens with a dispute over the taxation of trade routes, and continue that this premise is 'too complicated', that it's less Star Wars and more C-Span etc etc. This is a problem but not because it's too complicated; it's a problem because we're seeing the Star Wars universe from the inside looking out. The 1977 film worked because it was the story of outsiders adventuring into society, but we're introduced to the world from the inside, as two Jedi knights, Obi-wan Kenobi (Ewen McGregor) and Qui-gon Jinn (Liam Neeson) are dispatched to settle the dispute. It gets better: the duo find themselves stranded on Naboo and then Tattooine. They find an anthropomorphic guide (I'll get to him), have to rescue the Queen of Naboo, and find a 'chosen one'. There's our five-man band. Then they set out to get a MacGuffin (the T-14 hyperdrive) to get back into society. There's a good film there and it is a relatively good film for the first hour or so, but as soon as the MacGuffin is captured, our five man band is dispersed and it returns to being a film about a fictional society from the inside looking out. What should have happened would be for Darth Maul, the phantom Menace, to destroy the T-14 and buy himself some time to kill off the Jedis on Tattooine (and protect Darth Plagius' investment, if you know what I mean). Watto, realising his T-14 had been destroyed by lightsabre, accuses Qui-gon of destroying it as a cunning ploy to actually get his hands on both slaves instead of one. Watto goes to the Hutts to complain, and now four of our five man band has to investigate the sabotage while avoiding both the Hutts and Darth Maul, while Anakin (Jake Lloyd) builds a new fancy MacGuffin from scratch. The film's climax would have been jumping between the pod race and two lightsabre duels. This would have achieved several things: a) more screen time to Darth Maul, possibly the most enjoyable character to watch, b) given Jake Lloyd something to keep him occupied rather than reading his lines and yelling out the occasional, awful sounding 'Yipee', c) gave the title actual meaning, so the 'phantom' Darth Maul would 'menace' our heroes' efforts to leave Tattooine, and most importantly d) made it a story of plucky adventurers on the outside of society trying to break in, rather than being already in and moving around inside it. Wouldn't that be better? Another problem is the bizarre inclusion of racist stereotypes which appear twice. The first is the character 'Jar-Jar Binks' who basically exemplifies the old black minstrel stereotype, hidden behind the fact he's an alien (some sort of anthropomorphized catfish) but still manages to inject the word 'sir' into every sentence in such a way that I feel like he'd be tugging his forelock if his species had them. He's a truly awful, cringeworthy character who ruins every scene he's in. He performs the same function as Chewbacca in the first released trilogy, but while "Star Wars Ep. IV A New Hope" showed The Empire as a racist institution by their derogatory treatment of Chewwie, Jar-Jar Binks manages to give The Empire's institutionalized racism a justification. There's a theory going around that Jar-Jar may be a Sith Lord--don't believe it, it violates the Occam's Razor of film. He is a terrible character with no depth and absolutely no redeeming features. The next is Watto, a sort of flying bug thing which exemplifies the full gambit of racist Jewish stereotypes for reasons I struggle to understand. He fulfills every racist Jewish trope you can imagine and for absolutely no purpose. Considering that every time Lucas wants to create a villain, his first thought is 'how can I make these guys look like Nazi's', the inclusion of this awful character really makes no sense at all. I could also include the trade federation executives, who embody a rater racist stereotype of the 1980's Japanese businessman, I spent my first viewing of this film expecting one of the to commit seppuku for dishonouring something or other, but this trope is really overshadowed by the two aforementioned examples. Allow me to summarize the film: Two white knights go to meet two circa 1980's Japanese businessmen, but find that they've made a deal with the Devil and invaded Europe with an army of transistor radios. The knights then travel to Atlantis to rescue the princess, and find a black-face minstrel guide to sneak them around. From there they sail to Manhattan but are attacked by the Japanese businessmen and are marooned on a desert island. There, they must outwit the greedy shylock, and using money (or 'the only thing that works on him', to paraphrase), rescue his blonde-haired blue eyed white slave boy. With him, the clever knights take him to Manhattan so he can be raised in the one true faith. Then they return to Atlantis to help an army of negroes defeat an army of transistor radios, but since the radios are Japanese, they all fall apart. The knights have, meanwhile, infiltrated the Palace of Atlantis to confront the Japanese businessmen, but are met with a demon who kills one of them. The Japanese businessmen lose, but live to fight another day (save those hari-kari daggers for later! ), and the surviving white knight decides to take on Shylock's former slave to teach him in the one true faith. Star Wars Ep. 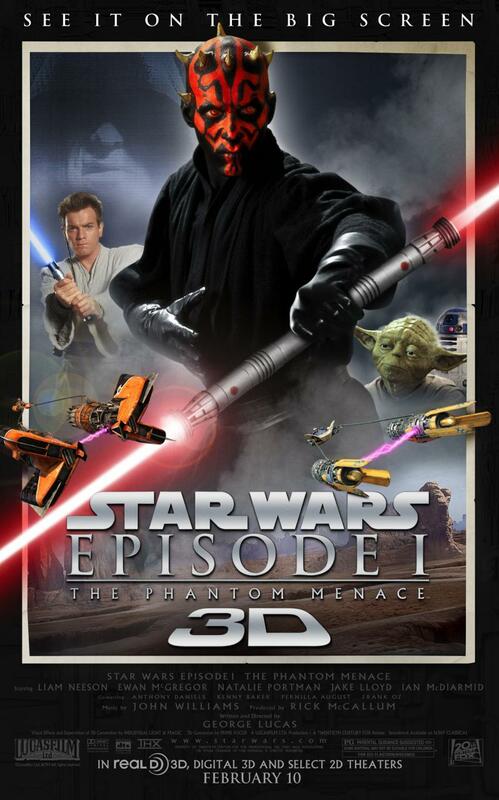 1: The Phantom Menace is a film which came close to working, but doesn't. I cannot award it two stars, and in deciding on it's rating I was very close to giving it an extra half star because of the music, which John Williams does exceptionally well, or Ray Park's high energy performance as Darth Maul, but the pointless and Bizarre racist stereotypes prevent me from doing so. A worthwhile watch if you're interested in the Star Wars universe, and might make an interesting double bill with 'Birth of a Nation', otherwise, don't bother.